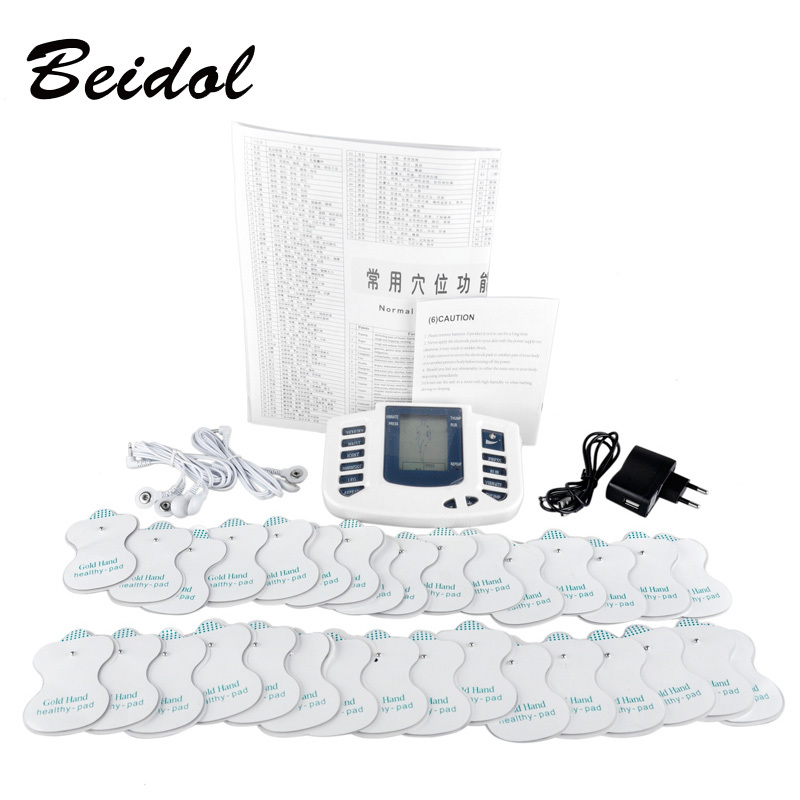 JR309 care health electric muscle stimulator Massageador pads Tens Acupuncture Therapy Machine Massager Slimming Body 16 unids Body Slimming Massager electronic pulse for pain relief stimulator muscle relaxation Massageador Tens Acupuncture Therapy Machine Why you need this massager? The massager based on physics, bionics, biological electrical, traditional Chinese medicine channels and collaterals Sciences principle. It is combined with a large number of clinical practice and adopted modern control technology research and development of microcomputer the latest generation of medical devices. Not only has the function of acupuncture, thump, massage, cupping, massage, scrapping, thin body, but also has function only immune regulation, and ingenuity to develop electrode infrared spectrum of normal temperature, make the effect of most wonderful therapy. characteristics It is portable, effective and good for health. Digital display for treatment guide. Medical electrodes used physical therapy. 6 programs and 10 power levels pre-programmed massage exercises. Suitable for waist, shoulders, legs, foot massage and physical therapy. 4 therapeutic modes: vibrate once, shiatsu, massage, pat and scrape therapy. It has the multiple functions of acupuncture, scraping, cupping and massage. The electronic pulse promotes blood circulation, relieves pain and promotes metabolism. Specifications Power supply: DC 5 V Current: 500mA Frequency: 1-50 Hz Power: 2.5 W Pulse intensity: 10 levels Package includes * Massaging * 1 * * Electrode pads 16 * USB Cable * 1 * Power Adapter (US, EU) * 1 We will send full voltage 110-220 V adapter * English user manual * 2 * Cable Connection * 2 (2-way and directions) It is without BOX and Battery . Notice: Please kindly follow steps 1 and 2 1. Stick the electrodes directly onto the skin to massage (treatment can not be made unless both of the two electrodes or four electrodes on the body surface).